Have you ever had a Kir or Kir Royale? You loved it, didn’t you. A Kir is a drink made with creme de cassis and white wine, a Kir Royale is creme de cassis with champagne. You probably knew that. Creme de cassis, a liqueur made from black currants, is heavenly. Since this is not the season for fresh black currents, I happened to find some dried black currents at the market recently, and decided to try infusing them in brandy. As this was made with dried currants, I hesitate to call it a cassis liqueur. It was however, a tasty substitute and extremely easy to make. 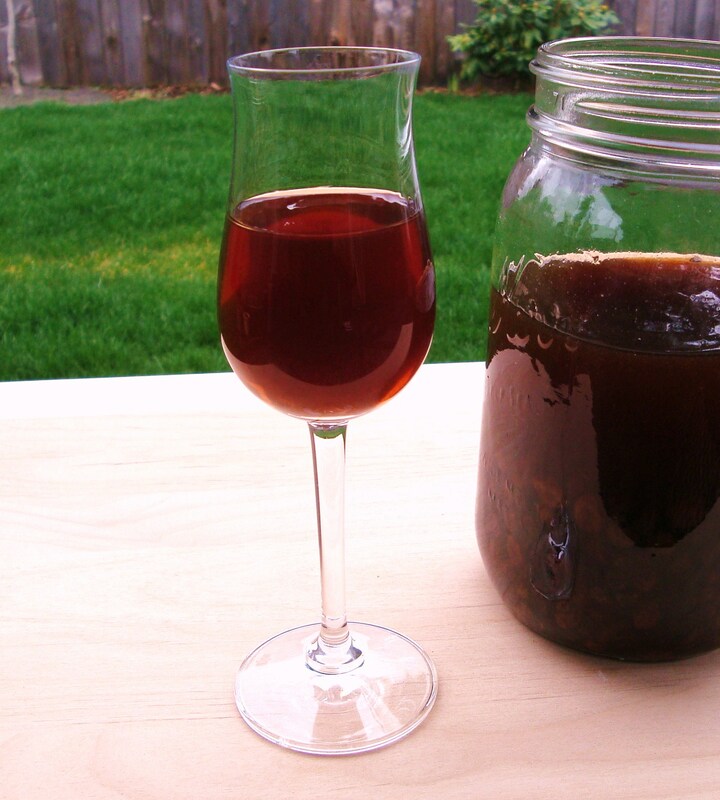 Combine dried currants and brandy in a jar and infuse for approximately 3 weeks or until it reaches your desired taste. Strain, filter, and enjoy. I really enjoy this version of the cassis liqueur. It is a little potent, but very flavorful. We have not yet tried it in champagne. I do, however, have a favorite cassis liqueur that I need to mention. It is made by Clear Creek distillery. If you are reading this post and live in the Northwest, I hope that you have been to this distillery. If you are planning any trips to Portland, please add this to your list of places to visit. It is truly exceptional. Clear Creek stands out among the growing number of craft distilleries in Portland. Whether you are looking for Eau de Vie, Grappa, Pear Brandy or fruit liqueur, you will not be disappointed. You can also find a recipe for Creme de Cassis at Food Perestroika. I have not tried this recipe but it looks excellent. Categories: Infusion, Liqueur, Recipes | Tags: black currants, brandy, Liqueur | Permalink. Clear Creek is amazing. Glad to hear you giving them some love. Their pear eau-de-vie is the best on the market, and their 8-year apple brandy is divine. You are so right! They have a tasting room in Portland and will let you sample everything. All of their products are amazing! I was even fortunate enough to pick up a bottle of their whiskey… sells out at lightning speed. This looks wonderful! I’m going to give it a try. Thanks for inspiring me! I’ve never tried infusing any spirit before, but I think this has inspired me to give it a try. Thanks! great! I hope you do and can’t wait to hear what you create! The deep red/black is awesome looking, but how cool would a white currant version of it be? Do you think it would appear clear or a bit hazy? Either way, this is a “must-try” when currant season rolls around. I want to make an Apricot Brandy for my cousin. Can I use dried apricots? What would the ratio to brandy be? Will this be different than buying Apricot Brandy? If so, what’s the difference? Never tried this before. Hi Carol, Yes – dried apricots in brandy would be lovely! I did apricots (a combination of dried and fresh) in vodka with vanilla bean and it was delicious! I would probably follow the dried currant brandy recipe, just substitute apricots. Add a bit more apricot if you want it to be finished quicker. I think with more apricots this might be done in a week or two. Add a bit of vanilla bean if you wish as well, and maybe even a little lemon zest. It will be great. I’m not sure how it will compare to the apricot brandy you buy… I’m guessing much better!